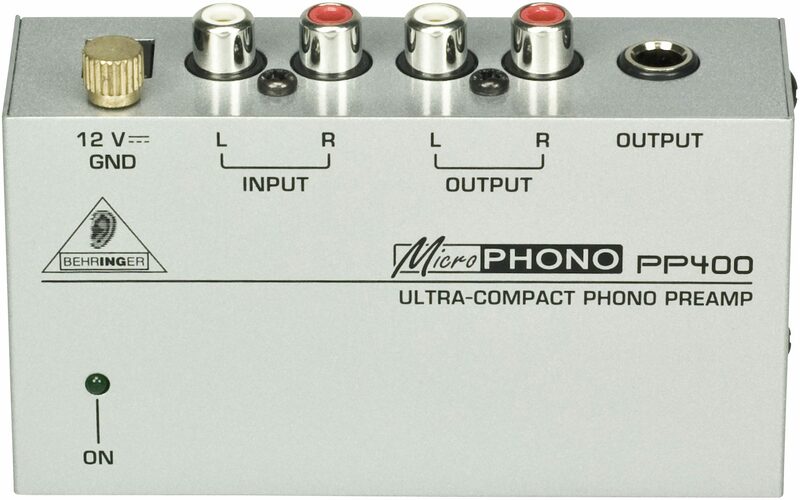 Plug in your turntables phono outputs and turn them loose onto a mixer or home stereo with the PP400 MicroPhono from Behringer. The fastest way to the lowest price, guaranteed! Found a lower price? We'll beat it, fast. $24.99 Seen a lower price? 60-Day Return Policy Applies on This Item - Get it shipped today and if it isn't perfect, send it back! In the age of the MP3, it can be easy to forget that a turntable signal needs a little help before it reaches a mixer or home stereo if it's going to be heard. Thanks to the Behringer MicroPHONO PP400 phono preamp, your turntable will get the boost it needs to bring your vinyl to life. 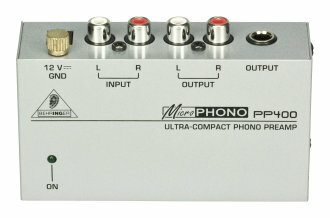 The compact PP400 features stereo RCA inputs and outputs, as well as a 1/4" TRS output jack. Its incredible low-noise operation delivers sound exactly as it's read from your records by the turntable's needle. Behringer has also included a 12 V adapter to power this awesome audio solution. Vinyl is making a huge comeback, and it's time to get your wheels spinning. Plug your turntable into the PP400, send a line out to a mixer or the AUX inputs on your home stereo, and take a spin on the freeway of retro-cool. For about the price of a couple of prerecorded CDs you can experience the high-fidelity sound of real vinyl, the medium that launched the rock and roll revolution. Same Day Music is an authorized dealer of Behringer products. Available until 11 PM (EST) today. Mention special code 206-9SNZ when you call. Copyright ©2019. This site is protected by copyright. There are terms for its use. Send us Feedback on our site and your experiences. Our descriptions, pictures, and prices are mostly accurate, but cannot be guaranteed. Cookies should be enabled in your web browser for full site functionality (details).